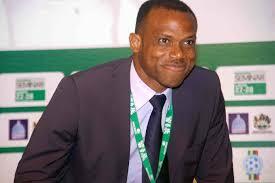 Head coach of the Super Eagles, Sunday Oliseh, has fully recovered from a virus infection, that kept him away from the country and is already preparing the home-based squad for the 2016 CHAN. Oliseh received the team in Pretoria on Saturday night and took to training on Sunday. “Oliseh is fully recovered now. We met him at the hotel on our arrival and he started training the team today (Sunday),” Oliseh’s special assistant Tijjani Babangida revealed.